We are engaged in manufacturing and supplying a wide range of overhead crane spares for our clients based globally. Apart from this, we are also offering customized solutions for our clients as per their specifications in given time. Master controllers are used for operation of contractor’s equipment controlling E.O.T. Cranes Rolling mills drives. Master controllers are of cam type where in contacts are actuated by individual cams mounted on operated shaft. Master controller is housed in enclosure and provided with an easily removable cover with ample area for maintenance. The cam shaft is mounted on bearing bushes on walls of housing. 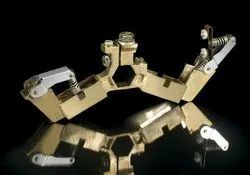 The cams are made of derlin material and fixed on square. In addition to wide range of applications in mechanical engineering applications, the thruster operated drum brakes are mainly used in material lifting and handling equipment, mainly because their 'Fial-to-safety' designs ensure safety to men and machines in the event of over failure. With the advancement in electric drives and electronics, the drives have pushed the mechanical systems to high level of operations and demanding safer and reliable braking loads moving at much higher speeds than earlier. Continuous developments in product improvisation and assured quality checks, the thrusters offer compact, reliable yet economical solutions to most of the industrial applications.. The two main sub-assemblies of the hydraulic thruster, the electric motor and the hydraulic unit are co-axially assembled form the working unit. In the switched off state (de-energised) the piston is at its lowest position due to external load (as brake spring of the drum brake), and the brake is applied. When energized, the electric motor drives the pump and delivers working fluid under the piston axially in the guided path, and delivers thrust or force required to operate the attached devise (like thruster brake) via the piston rod and the eye-lug attached to it. The working stroke can be sleeplessly controlled by external load. The thruster is designed for long trouble free service. 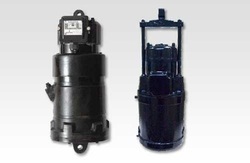 The motor winding are designed to meet contingencies. The bearings are adequately sized. Brakes are applied on brake drum. The shoes of the brakes are applied on brake drum in normal condition. When the motion is to be obtained the brake shoe are released and the brake drum is free to rotate. For infallible operation of machinery, modern methods are necessary, any machine which requires its motion to be controlled, whether it is a lifting Crane, Hoist, Winch or Mining Haulage today employs an Electro Magnetic Brake, enabling the operator not only to control the motion but also to hold the load at any desired point without danger of falling, merely by release of the starting handle. 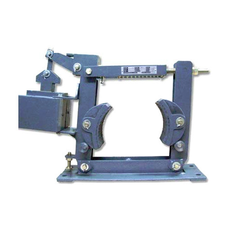 Electro magnetic Brake is adequate equipment for safer operations of machinery. Electro magnetic Brakes are used when a load must be stopped rapidly to prevent it from rotating. Electro Magnetic Brakes find its use in Paper Mills, Drives of certain textile machines, Sugar Mill Machinery, Rubber Mixing Mills. .. The Shoes are of cast iron and other components are of fabricated steel. The lever is hinged on the main arm, which is connected to the side arm through a tie rod, and is stressed by a pre-loaded compression spring. The compression of the spring can be adjusted to set the braking torque to desired value. The brake liner of selected quality material is riveted to the shoes by aluminum rivets. A.C. solenoid with laminated magnetic sheet steel houses a copper magnetizing coil which is impregnated with Class F materials. The plunger which is connected to the lever, is drawn in to the coil, when it is energized with AC source. This loads the spring and releases the brake shoes from the brake drum. When the supply is cut off, the plunger is pulled out of the coil, and spring force clamps the brake shoes on the brake drum and the brake is applied. Thruster brake is a device used to retard the speed of moving machinery and to stop it accurately to the desired position. The braking force is applied to the brake shoes by a pre-stressed comprising spring. The shoes press on the rotating brake drum retarding its speed and finally stop it. The releasing of the brake drum and compressing of the spring is done by thruster. A thruster shoe brake has a pair of cast iron shoes which are lined up with friction pads. The shoes are hinged on main arm and side arm of the brake, each of them have a hinge pin fitted in the base. They are connected to each other on top by a tie rod, which is hinged in the main arm and locked to the swivel block in the side arm, by a lock nut. A crank lever is hinged on the main arm and the other end is fixed to the top clevis of the thruster by a hinge pin. A brake spring is fixed on the main arm and is pre-loaded by a locknut on the lever. The pre-tension in this spring decides the braking torque. The thruster is fitted on the base by a hinge pin. When the thruster is not energized, the brake shoes are pressed on the brake drum fitted on the drive motor shaft and hold it under the effect of braking force provided by the spring. In such condition, the brake is applied and the drum cannot rotate. As the piston travels upwards the angle lever turns, pushes the brake rod and compresses the brake spring. Simultaneously, the brake lever on the other side of the wheel (Brake Drum) is retracted. When the first lever reaches the stop on the brake base member the brake lever at the thruster begins to move, releasing the brake drum. 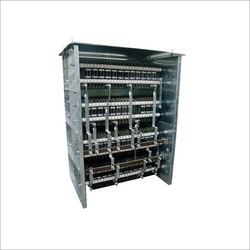 We are the leading manufacturers of S.S. Punch Grid Resistance Box. Rolex punched Steel resistance boxes Consist of Grids Punched from Nickel Chromium Steel Alloy Sheet. The series connection between adjacent grids is by means of copper jumpers. The resistors, after overloads of moderate duration, become red hot but no damage is caused and retains their shape after overload disappears. 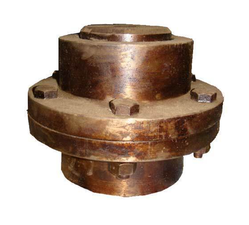 Geared couplings are used to connect two different shafts or offset shafts. 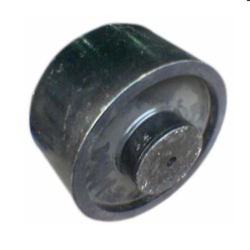 Geared couplings are made of EN material to absorb shocks. Geared coupling consists of gear which transmit the motion smoothly by absorbing shocks. Product DescriptionWe are counted among the most trusted suppliers of the premium quality Slip Ring Carbon Brush Holder. Known for their superior finish and impeccable functions, the products are very reasonably priced. We are acknowledged to offer a range which is quality tested and designed as per the industrial standards. 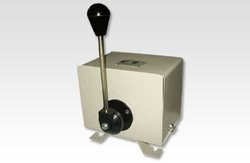 Rotary geared limit switch is used to trip motor supply when the moving loads reach the extreme end positions of working zone. 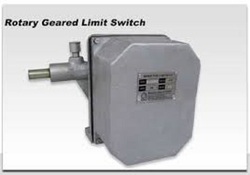 Rotary geared limit switches are suitable for use on reversing drives such as Hoists, winches, rolling mills and various other mechanisms used in steel plants such as coke oven, feeding machinery etc. A two(or more) contact elements are operated by respective rotating cams, suitably adjusted on a cam shaft which rotates with fixed speed ratio of the drive motor shaft. The cams can be steplessly positioned so that they trip motor supply and stop the motion at the set point of travel. 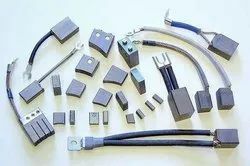 Product DescriptionWe supply a latest range of Industrial Carbon Brushes that finds application in various machines used in industries like steel, power generation, paper and others. Manufactured in compliance with international quality standards, our range is acknowledged in industry for its superior performance. Further, we offer customization to our clients terms of thickness, length, width, material, spring diameter and cap diameter.